All types of wood floors can be restored, including most softwood such as cedar, pine, and spruce, and hardwoods such as ash, birch, cherry, elm, hazel, mahogany, maple, oak, teak and walnut. Different types of finish available, including matt, silk, gloss or wax. Wood floors feel fabulous underfoot, but they don’t take the knocks as well as some other types if floors. They are also expensive to replace, so let us look after your investment, bringing it up like new in no time at all and with minimal disruption, and with no mess and no dust. 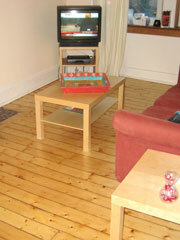 At Cleaning Doctor, we provide a comprehensive service to sand and seal wooden floors. 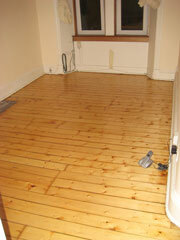 We can finish a newly-laid wooden floor or restore a well-used scratched and dented floor to an immaculate finish. We can restore all types of wood, including softwood such as pine and hardwoods like oak, mahogany and ash. We use a sanding machine that has four multi-drive rotating sanding discs and a vacuum dust removal system. This system is significantly superior to commonly used barrel sanders, which can gouge and mark a floor. Our system may be slightly slower but the finished surface will be absolutely outstanding. Discover what’s hidden beneath your carpets. This wooden floor, which was hidden for years under old carpeting, was sanded and sealed to a new finish – what a delight for the apartment owner.Keep your wood floor looking better for longerThe finish of your floor is as important as what it’s made of.Soft woods most definitely need a little help to maximise their lifespan. While hard wood is more robust and expensive, you’ll want to protect it too. And there are room-by-room considerations to make — a waxed floor is more warm and welcoming in a bedroom, for example, while a in a entrance hall, you’ll need a finish that meets the demands of high traffic and a harsher environment. At Cleaning Doctor, we use only the best available seals and floor dressings to enhance the wood-grain and protect the surface. The type of finish you want will define the type of seal or floor dressing we apply. We’ll help you assess your needs – without obligation – and advise you on the best finish for you and your floors. For example, you might want a wax finish on a pine bedroom floor and a hard polyurethane finish on an oak hall or dining room floor. A floor seal will withstand a certain amount of use before it is worn away, and then it will then require professional replacing. 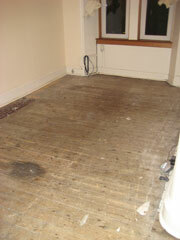 A floor dressing can also be applied to protect and seal bare wood. Please ask your local Cleaning Doctor Floor Restoration specialist for advice on which is the best protective coating for your particular floor.